Large 5 bedroom, 3.5 baths, hot tub, pool table, fireplace, views, close to ski lifts, meadow, privacy, hiking trails, quiet neighborhood, 6 TV's, 2.5 miles to the sandy beaches of Kings Beach on Lake Tahoe. Bedroom 5...Queen bed with TV. As you walk in the front door, you are greeted by the open floor plan with high beamed ceilings. The living area has a large leather sectional with 2 recliners. It faces a 50" TV, wood burning fireplace, pool table and overlooks the views. 2 sliding doors exit to decks. The front deck has comfortable seating and looks out to a tree lined mountain. The back deck has the hot tub, BBQ, seating and open meadow with an abundance of wildlife. In the summertime you can set up a volleyball net, in the wintertime the meadow becomes the perfect snow play area. From anywhere in the Great Room you can watch TV, listen to music, enjoy the fireplace, look out to the views, and socialize with your family or friends. The kitchen is fully stocked with all the items you'll need for a weeks stay. Pots, pans, 2 coffee makers, toaster etc are provided. There is plenty of cupboards and granite counter tops for all the chefs. The dining table is next to the slider that exits to the deck with an oversized hot tub.. You can see endless stars at night, and watch squirrels running in the meadow during the day. There is a 1/2 bath next to the dining room. Down the hall is a laundry room , two bedrooms and full bathroom. It is a separate area in the house that is private from the living area. Great set up for children who nap or adults that want peace away from their group. One room has a king bed with twin bed and TV. Next to this is a room with queen bed with TV. All the bedding is 'Hotel Style' with 300 count sheets, duvet, bed cover, 4 pillows and extra throw. Both rooms have large windows with views of a tree-covered mountain and spectacular sunrises. Up the stairs is the Master bedroom with King bed twin bed, TV, and bathroom. Adjacent to the master room is a bedroom with a Queen bed, TV, walk-in closet, and twin bed that is adjacent to another full bathroom. Across the hall is another room with King bed, TV, and twin. All the bedrooms are large enough to accommodate the extra beds without feeling cramped, and have views of the meadow and trees. Each room is unique and will give the charm and comfort you'd expect from a Lake Tahoe mountain home. The furnishings and style is Pine lodge decor and the open areas and high ceilings allow you to socialize with family or friends, without feeling closed in. The house is located in a quiet pocket of homes surrounded by tall pine trees and hiking trails with easy access to all the activities Tahoe has to offer. In the wintertime, Northstar, Alpine Meadows and Squaw Valley are all within a short drive. There is a shortcut to Alpine and Squaw that will eliminate ski "rush hour" traffic along the Lake. In the summertime, the open terrain becomes some of the best hiking and biking trails on the North Shore. You can access the trails at the home and go for miles. All the roads in the neighborhood dead end at trail heads. North National Park is walking distance to the house and offers Frisbee golf, ball fields, snowmobile rentals and much more. The Lake at Kings Beach is 2.5 miles away and has boat and kayak rentals. Shopping and entertainment are here with casinos 3 miles away that will satisfy your thirst for nightlife. Crystal Bay Club is known for its music venues, and Cal Neva for thier spa services. There is an abundance of restaurants and shops up and down Kings Beach that will cater to your daytime or evening dining fancies. Many tenants come here with a list of activities, and choose to stay at the house and enjoy the trails and solitude the house offers. Whether you are coming to Tahoe to spectate or participate, this is the perfect place to come home to. Lake Tahoe has been my playground for 20 years. With all the traveling I’ve done, there is nothing compared to the amenities and beauty the Tahoe basin has to offer. I purchased my first home here in 1992 and decided to share it with others when not in use. I now have many 5 and 6 bedrooms homes I offer for your enjoyment. 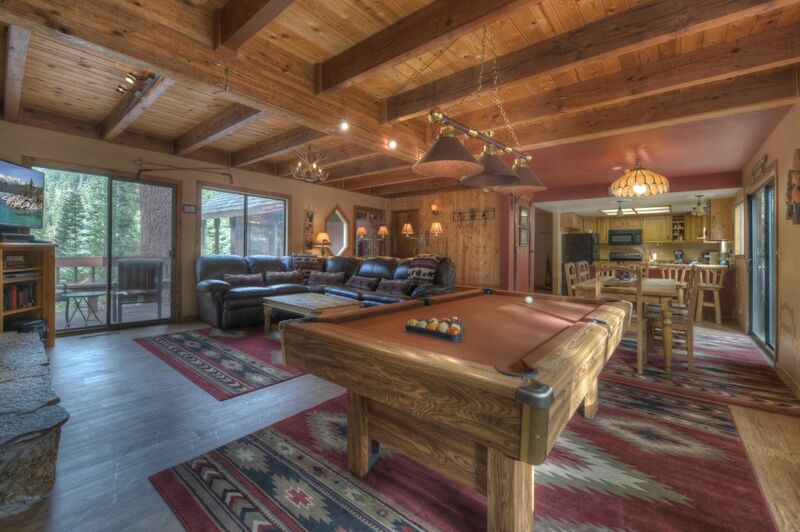 Each have hot tubs, most with pool tables and in locations that allows easy access to the Lake and Ski resorts. They were purchased for vacation rentals and are designed to be user friendly with all the amenities of home. I have a full time staff that includes cleaning, maintenance and will respond within 24 hours for all your needs. Feel free to call me about my other homes, or to just to discuss the perfect ski run on the perfect day. I bought this for size and location. All the bedrooms are large, and the neighborhood is quiet surrounded by great hiking trails. When you walk into the home, you'll feel like you're in a mountain lodge. Plaid carpet, stone wall fireplace, comfortable mountain furniture. A nice open living area all connecting to the outdoors where there is a huge meadow. You'll feel away from it all here, but close to downtown Kings Beach, and Northstar Ski Resort. Kings Beach has some GREAT lake front restaurants days to hang out, and evening dinners. The beach's are spectacular here and some secluded. There is always something happening at the State Park. At times I'll stay here and never go anywhere. There are easy walking trails all around the neighborhood. AND whether you bring your dog or not, there are neighbor's dogs that will walk with you. Its super quiet, both day and night which I love, and sitting in the hot tub and watching the wildlife without moving is good entertainment. Verizon extender in the house. Central Air will keep you toasty all winter. All rooms have windows that open for cooling in summer. Upgraded linens with 4 pillows, blanket throw, hotel linens, blanket throw, foam topper, blanket cover. Large parking area with 2 car garage and street parking in the summertime. Large open living area with pool table, entertainment center and patio doors that exits to 2 decks. Lodge furnishings and decor. Fully stocked with all cooking and dining amenities. There is a variety of pots and pans... and enough dinnerware for your group. Nice dining table that seats 8 with additional bar area with 4 log chairs. Slider exits to deck with additional seating. Kayak rentals are 2.5 miles from the house. Lots of nice calm water and inlets to kayak on. Nice decks in front and in back of house on meadow. Open meadow for snow play in winter, and playing ball in summer. Golf is 2.5 miles away at the Brockway Golf Course. Located directly across the street from the Lake, its an added bonus to have Lake views while playing. Hot Tub on deck overlooking meadow. You can sit in the tub, and watch the squirrels climb up the tall pine trees. I stayed at this beautiful cabin with some family and it was a great place to stay. The cabin is spacious but feels cozy. No complaints and would definitely rent here again. As all the past reviews mentioned, this home is very accommodating for a big group - bedrooms are big, bathrooms are ample and big - and best of all, kitchen is completely stocked with everything you need to make big family dinners. There were a few things that I feel need to be mentioned for future renters....STAIRS...STAIRS...and STAIRS. Even though I knew from all descriptions in the post that this house was upstairs - I clearly reviewed the layout, as to accommodate my two 70+ year olds that were in attendance. Since this house how two bedrooms on the main floor it was perfect. However to our surprise, when we arrived - we then found out that there are a lot of stairs to the front door - whether you enter in the front or through the garage. Having to travel with people that need handicap access - this was a big negative to me and my mother in law and uncle. There needs to be something in the description that there is no handicap access. My relatives - and as you can imagine, my mother in law will never let me forget this one - were limited on this trip since once they were able to get up the stairs - which was long and painful - made sure that they only left the house once a day if that - because they couldn't handle the stairs, or felt awkward asking for the kids help. Since this is not an issue for everyone - I'm not lowering my review because of this - but kindly requesting from the owner that this is mentioned. Unfortunately, I would not have chosen this place if I had known about the entry stairs. Weekend with the guys...nice big cabin with comfortable beds which we needed after skiing all day. Had a blast. Very well stocked, comfy beds and pillows. We very much enjoyed the house and its facilities, and the close location to town, and skiing. The instructions were all good, and we had a very enjoyable time. Recently my company took a few days off to take a trip up to tahoe, and ski. I am so happy I booked this house, it was the perfect size for us! I loved the house decorations, it made it feel like we were in a cabin! The dining table was perfect, we played a few rounds of Cards Against Humanity, filled with jokes and laughter! The only downside was the driveway. There is a hill and the flat area is a bit small. OTHER THAN THAT WE HAD A GREAT TIME and will definately rent again in the future! This vacation rental was very nice, the beds were quite comfortable and the kitchen well supplied. We were there during very heavy snowfall and staff came by to clear the steps and hot tub deck which was nice. The bedrooms over the garage are quieter than the ones over the living room, so choose carefully. If you come when there is lots of snow, be aware that it's a bit of a drive from the main road and the driveway is steep, be prepared. Sandy was responsive when we had questions - the garbage pick up doesn't take recycling, by the way - and she was prompt and professional to work with. Thanks for the review and I’m glad your group enjoyed the house. Feb/March 2019 was the most snow Tahoe has seen in 2 decades which made driving more interesting. The house is 1.5 miles from Hwy 267 and typically an easy drive along with the gentle slope of the driveway ( see pics). Nothing is flat in Lake Tahoe. Cal Trans maintains the roads, and I have a hired snow plow service that maintains the driveway. With 4 wheel drive neither is usually a problem. I hope you can return in the future! This house is in the middle of the Northshore and has easy access to all Lake Tahoe has to offer. 1.5 miles from the highway, getting around the Tahoe Basin is effortless. The drive around the Lake is breathtaking and you'll enjoy the different little towns that surround the Lake. . The house is in a quiet pocket of homes just up from the Lake at Kings Beach .All the homes here sit on a meadow with tall pine trees, and the roads dead end at the hiking trails. Winter and summer they are used and maintained by the forest service. It borders the Tahoe Rim trail which is a destination for some with endless hiking trails you can access from the house. Brockway Summit is well know for its path to Tahoe City, and Watson Lake is worth hiking too. You can walk in the summertime to our neighborhood park, North National Park. The park encompasses approximately 124 acres of predominantly active recreational activities. An 18 par fitness course, ball fields, Frisbee Golf, playground are just a few options. In the wintertime they offer a nice sledding hill for tubing and snow fun. Within 20 min to all the ski resorts on the North Shore, Northstar in the closest and newest village. The village was modeled after Beaver Creek Colorado...cobblestone sidewalks, copper roofs and a multitude of restaurants and shops that line the 'square'. The square is an ice skating rink in the wintertime and roller skating in summer. The bon fire pits and outdoor bars are always there. Its a wonderful setting to hang out at especially at night. Skiing here is family orientated with lots of ski programs for all ages, and a pristine mountain that keeps a good grasp on good snow conditions. If your staying a week, I highly recommend taking advantage of the other resorts also. A bonus is from the house you can drive the back way to Alpine and Squaw Valley which will eliminate the morning traffic through Tahoe City. Both mountains have tons of excellent skiing, and mountain biking in the summertime. MT Rose is where to go for open terrain, Diamond Peak for kids and an easy day skiing. Both are 15 min to the house. In the summertime, Kings Beach just down the street is a State Park with lifeguard and lake toys to rent. The beach is the highlight with wide sandy beaches, and views you have to experience to appreciate. There are also smaller beaches up and down the strip for reading a book, and dog beaches for your loved ones. Brockway golf course in Kings Beach is a must for those that just want a good time. One of the top 9 hole courses in California, its known for its yardage and views. In the wintertime the course becomes a snowmobiling park. Tahoe City is 12 miles away and offers another nice city with shops, restaurants and outdoor venues. The Truckee River is our playground for fishing, river rafting, and bike baths to view all. A nice day is renting your bike in Tahoe City and riding to River Ranch. This is a river front restaurant with large outdoor patio at the entrance to Alpine Meadows. Here is where the river tours end and usually where the rafts have issues. You can spend the day here watching the rafters and enjoying their menu and drink. Between the location , amenities of the house, and your favorite family or friends, you'll have a great home to stay at while getting a true Lake Tahoe experience.